I like the pictuer. You do it? Can i be in. What sort of characters do you need? Penny_to_pay wrote: I like the pictuer. You do it? no i did not do it. and yes you can be in and sure a werewolf would be cool. You and anyone else can be anything really Vamp, vamp hunter, werewolf, witch what ever just make sure you play your char and the story that is being told. Sounds good to me. I'll make a bio then. Whats the aim of the whole thing or is it just a meandering tale, which would be nice to. well i like to keep my RPs opsn so that way its not to liner i may write in a sub plot with in the plot that everyone is makeing but i hate it when someone close up the line for anythign to happen and make you do something cuse its his or hers plot and RP. Sounds cool to me, but i don't mind conforming on occassions. Let me know if there is anything you want to me to do. I start something in the RP soonish, when i get a chance. To much work!!!! Green eyes, black hair, White skin. Thomas was breed by his parents in a strange way. His father, Arthur Dickinson was a Vampire Hunter, and was murder by Domokas Maundrell himself, trying to hunt him, near the edge of the city. Thus, he decided to follow his father's steps, and he swore he would never rest until he found Domokas and slayed him, as a revenge. He's known as the most important Vampire Hunter in the country, and he has developed an amazing weaponry against them. He also dedicated 2 years of his life in Kung Fu and Ninja education, because he knew he had to be prepared. 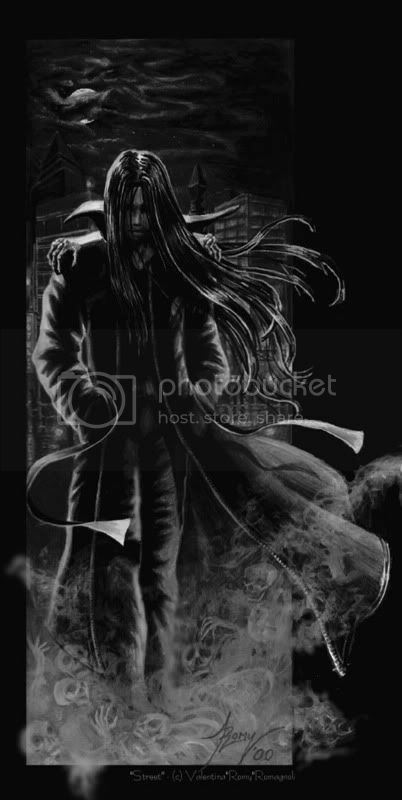 Appereance- He wears his large coat, always in black, for this is the way he can hide best in the night. When he's hunting, he wears his black sunglasses, and he has a fighter-sort red ribbon around his forehead. In his chest, he has the cruise, made of silver. I have only one question , where are we??? Heres the new bio, sorry it took so long. Age: Unknown, but he thinks he might have been born in the Anglo-Saxon period. Weapons: his claws and his jaws. Other: Cripslock doesn't know how old he is, but he seems to just keep on going. He accepts the fact he is a werewolf and is fine with killing people. He doesn't do it for pleasure, he does it for money. He takes pleasure in the hunt, but he hates a timid prey. He takes delight in the skill. Many people have tried to kill him in the past, but all have failed, though many have come close. He likes it to be reminded that he can die. he has never turned anyone, he has never found anyone worthy enough and he is to arrogant for his owen good sometimes, though he does care about people sometimes. He has been married twice, although he would nver turn them because he wanted them to stay as what they should be. This sounds interesting. I'll post a bio soon. If that is OK with everyone. I don't think it's going anymore Smog... There hasn't been any activity here or in the main thread since Nov. I figured it was. But "Hey! ", what was I out? *shrugs* A few minutes typing the reply up.